With nursing vacancies at a record high, the NHS and agency MullenLowe London launched a long-term campaign to inspire a new generation to keep the health service going for decades to come. As national pride reached fever pitch this summer during England’s World Cup journey to the semi-finals, the agency MullenLowe London attempted to direct some of that feeling to another institution: the NHS. Launched on the health service’s 70th anniversary on 5 July, "We are the NHS" is its biggest ever recruitment drive. It comes as nursing vacancies are at a record high, with over 34,000 open roles and some parts of the NHS only able to fill one in 400 posts. The £8m campaign, funded by NHS England and the Department of Health and Social Care, was made in only a matter of weeks leading up to the anniversary. But it represents a long-term strategy to inspire the next generation of nurses to keep the NHS going for decades more. "We want people to look at this work, sort of thump their chests and say 'Bloody hell, I love this country and I love the NHS'," says Hugh Todd, a creative director at MullenLowe. "It has been part of the fabric of our society, but it must be going forward." The brief given to MullenLowe had two aims: to inspire pride in the NHS and to encourage people to become nurses. The agency began working on the campaign immediately after winning the pitch. There was no time to waste, not only because of the fast-approaching anniversary, but also because it takes years to recruit and train new nurses. When the creative team first wrote the ad, it included some black and white historical footage, but the agency scrapped this idea in favour of a more modern and progressive approach. This couldn’t merely be a celebration of the past, but a call for the future. "It goes above and beyond generations, because everyone at some point will come in contact with the NHS," says MullenLowe creative director Lovisa Silburn. The winning idea was to film the ad inside working hospitals. Every person seen in the 90-second film, including the woman giving birth at the end, is a real patient or medical professional — even their names remain unchanged in the voiceover. To direct the ad, MullenLowe brought on RSA Films’ Toby Dye, who has a history of documentary work including the award-winning 2010 film Bodysnatchers of New York. Dye says that before the NHS project he had "never worked on anything with such an insane schedule": the time from winning the job to delivering the first edit spanned only three weeks. A small crew of about four people shot at hospitals in Margate and Ashford. So tight was the timeline that they met many people in the ad for the first time as they filmed them in hospital wards. The team wrote and rewrote lines of the script on location to fit the footage being captured. "It was a terrifying pace, but it turned out to be one of the greatest strengths of the film," Dye says. "Everything is normally so planned that it can drain all of the life out of a film. Because we couldn’t do that for this, everything was real and captured ad hoc, and it gave the film vitality." 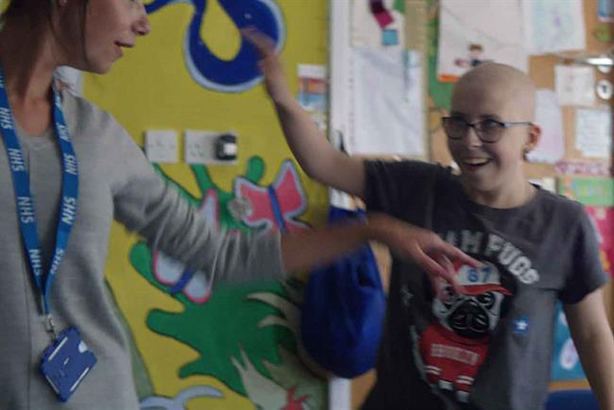 The unorthodox nature of the shoot meant that the crew captured unexpected moments where "life was stranger than fiction," Dye says, pointing to the scene in a children’s ward where nurses dance with a young cancer patient. "That just happened," he recalls. "There were moments that even the best writer or director wouldn’t have thought of." Besides these surprises, the plan was always to start and end the ad with a birth. The crew found a woman undergoing a caesarean delivery who agreed to be filmed, and the parents requested that their baby’s actual weight and time of birth be included in the voiceover: Maisie, born at 3:49am, weighing 7lbs. 2 oz. "Everyone was super proud for us to be filming because they wanted the world to see the great work that the NHS is doing," Dye says. The team also created shorter films for social media to show off the over 350 different nursing careers available in the NHS. The health service is using these spots on Snapchat and Instagram Stories to reach a younger generation. The campaign aims to increase the total number of applications into the NHS by 22,000 as well as double the number of nurses returning to practice and improve retention of staff. While it is still too soon to gauge the results, Todd, Silburn and Dye say they have received an outpouring of messages from nurses who are proud to see their life’s work recognised on screen. But Dye says he has never before filmed people who were so "matter of fact" about being in a commercial. Once the shoot wrapped, the nurses were quick to turn away from the cameras and get back to work. They have made an impression. Weeks later, Todd says he is still thinking about the nurses he met. "We’re out here in agency land, but they’re still in there while people are having babies and having chemo and living and dying," he says. "They’re looking after us all the time. It’s massively humbling."